Follow the adventures of Adrian Thomas, our wildlife gardening expert, and be inspired to create your own wildlife haven on your doorstep. Adrian posts here every Monday and Friday without fail, so make it a date and drop by! The following is a genuine experience I had earlier this week. I was busy in the garden, minding my own business, when I heard a woman's voice, loud and clear, the other side of the hedge. "Aren't they big and lovely?!" she said. "Huge!" said a man's voice. "It's because they're in a sunny position." Ah. Now I twigged. 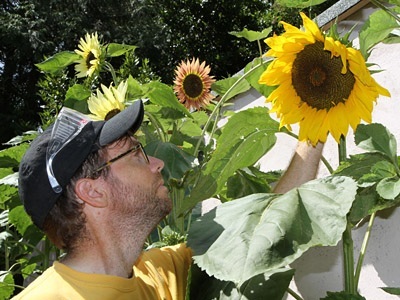 They were talking about my sunflowers! Back in May, I revealed my garden boudoir, the place where the birds come to wash and brush up and make themselves beautiful. We don't admit that it is made out of an upturned dustbin lid because the birds think it is a bijou washroom. 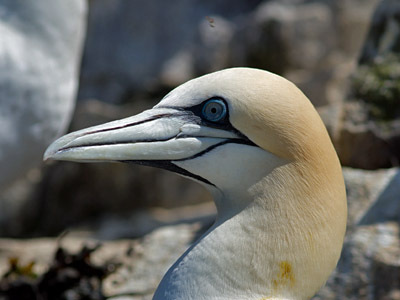 Let’s start with a photo of a garden bird…or at least it is if you’re a warden or lighthouse keeper on a remote island! Yes, I’ve been on my holidays, following the yearning to go and see Puffins and Gannets and all the other wonderful wildlife of Northumberland and Lothian (my Gannet above was on Bass Rock). Last week I mentioned that my bats were enjoying circling over my cornfield wildflower glade, so I thought it was nigh time to show you how the glade is looking.